I attended a fascinating class, given by Dr Emily Yu Zong, on ‘Racial Melancholia’. 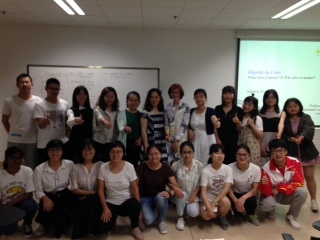 The class was part of a humanities course on ‘Happiness’ at Xiamen University and the students were attentive and engaged. The content explored distinctions between ‘grief’ and ‘melancholia’, racial stereotypes (for example, of Asians in the USA) and how they impact – for better or worse – on individual aspirations. Dr Xiaofei Liu, a philosopher, is director of a ‘Lab of Philosophy and Virtual Reality’. 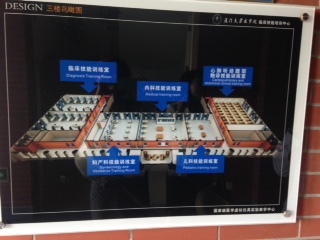 He introduced the lab’s potential in ethics education. I was also shown around the large simulation suite on the new university campus. Xiamen (pronounced Schamin) is on the southeast of Fuijan Province and at the estuary of the Jiulong River. Taiwan Island is just across the Taiwan Strait from Xiamen city. The city island of Xiamen is considered one of the most beautiful in China with an impressive mix of older buildings and ultra-modern architecture, bordered by a sandy coastline. A 20 minute boat ride away is Gulangyu (Kulangsu) Island which is known as the ‘Garden on the Sea’ and also as the ‘Island of Music’ due to its many past and present musicians. 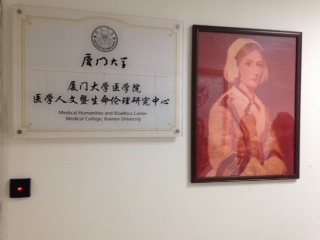 Xiamen University was founded by Tan Kah Kee in 1921 and was the first university set up by an overseas Chinese leader. It has approximately 40,000 students and 2500 full-time teachers and researchers. The main campus is impressive with grand buildings, a lake and many services for students and staff. It has been described as China’s most beautiful university. It is no surprise, then, that both the islands of Xiamen and the university campus are popular tourist attractions. At the end of each day and every weekend, many people queue to enter the campus, visiting the museums and taking photographs beside the monuments (see http://en.xmu.edu.cn/ ). The couple in the photo was particularly welcoming with ‘Mrs Li’ saying, through the interpreter, that this was the first time she had met a ‘foreigner’. She asked me for a hug and I was happy to oblige. As I was leaving she said I should give their best wishes to my parents. The circumstances of two other couples we visited were less happy with one partner having experienced a severe stroke and needing all care. 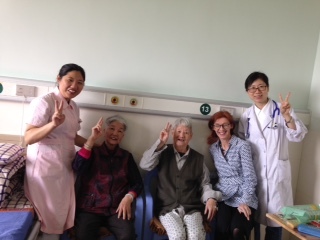 One of the teaching sessions I led this week, revealed a lot of common ground between student and staff perceptions of dignity in care in China and in the UK, for example, the importance of not exposing patients, respecting confidentiality, offering choice and obtaining informed consent. Differences arise in relation to care and medical decision-making, with family decision-making prioritised in China. Some of the conversations I have had this week point to another perceived difference between China and the UK. In Confucian philosophy ‘filial piety’ is a virtue of respect for parents, elders and ancestors. 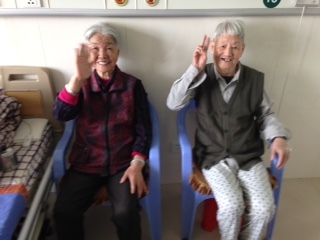 Some people here talked to me of the important role grandparents play in caring for grandchildren, others described coming home from abroad to care for elderly parents and still others talked of a change in Chinese culture whereby middle-aged people neither welcomed responsibilities to give or receive family care. An academic told me, that amongst older Chinese people filial piety was an expectation and to be admitted to an elder care facility would be considered ‘a disgrace’. Should adult children be made responsible for the care of their elderly parents? If not, who is responsible? (i) The individual themselves, making plans in their younger years for elder care? (ii) Governments, providing care for all or only for those who have limited resources? (iii) Or fellow citizens, charities and churches? Should grandparents be expected to care for grandchildren? This week there is a three day holiday in China and I will continue with visits and interviews after the break.